More than 1 month and 45km later, I am ready with a field report of the Kinvara 1. Well, the Kinvara 2 is now out in the market and available in outlets here in Singapore but then better late than never. Endoskeleton Synthetic Lockdown ensures a secure, supportive fit. Strategically placed memory foam in the collar provides a snug, comfortable feel. Hydrator Collar Lining helps wick away moisture and offers great next-to-skin comfort. EVA insole for lightweight underfoot plush. Heel ProGrid LITE midsole is 20% more responsive than EVA and supplies exceptional cushioning. High Abrasion EVA (EVA+) is an extremely lightweight grade of EVA that provides supreme cushioning and durability. XT-900™ carbon rubber outsole delivers multi-surface traction and long-lasting wear. I must admit I am not too sure whether these stuff are for the Kinvara 1 or 2 or they are the same for both. 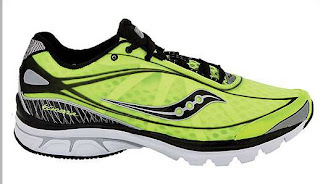 Design: Like most of the newer Saucony shoes, the Kinvara comes in an assortment of colors of which the most striking is the sole. It doesn't really look like a conventional running shoes, what with it almost flat heel to toe drop compared to the usual big solid piece of heel lift and thick outsole. However, it is still a good 18mm thick at the heel and this makes it very different from the thin sole of minimalist shoes which the Kinvara claims it is. Sizing: Saucony shoes does not come with wide version but I had no problem with the fit so far although it felt a big loose on first wear and subsequently after adjusting the lace, it felt too tight on the instep but I guess it is nothing an adjustment of the laces won't solve. So far no blisters, no abrasions on the big toe, yet. Grip: Dry ground, wet ground. The triangle shape outsole gripped wet on both wet and dry ground. However, I have not worn this for trail running since it is not a trail shoe so I can't comment on how it will perform on trails. But so far I like that even on the smooth surface of the overly common pavement of our parks, the shoe ride well unlike some running shoes which tends to have poor grip on wet pavement. Flexibility: Because of the thicker insole, it is not as flexible as say the Terra Plana or the NB Minimus. But there is no hard plastic under the arch so it does allow for a fair amount of flex although it would have been better if the EVA foam on the arch would have been reduced. Ground Feel: Not as good as I would have like. In fact, I felt the Fastwitch provides for a better ground feel. Cushioning: There is a fair amount of cushioning which will probably have the barefoot advocates throwing up their hands in horror but in my current condition, the cushioning suit me just fine. It was cushy enough but yet allow for a fair amount of bounce. Waterproofing: To date I haven't run in wet weather so far and have no chance to test how good is the waterproofing. But the upper comes with an unique thin net like cover which presumably will deflect away rain drop. But whether water that gets in will drain away easily, remains to be seen. Conclusion: Saucony claims the Kinvara is a minimalist shoe. In my opinion, it is not a true minimalist shoe since it does not have the full characteristic of a minimalist shoes i.e. 0mm heel to toe drop and zero cushioning. At most, it is an in between shoe or a transitional shoe - for those switching from conventional shoe to barefoot running and not yet ready to take the full plunge. But it is a wonderful nifty transitional shoe. Just reading the many well written favourable reviews on the web made me go gaga. And if not for the fact that Kinvara 3 is on the way, I would strongly recommend those who are looking for a sufficiently cushioned shoes to wean themselves off the traditional shoes to try out the Kinvara.